Addressing our gender pay gap – where are we today? This year's gender pay gap figures show little improvement. According to the BBC, the overall median gap revealed by the latest exercise stands at 9.6 per cent, little different to last year’s figure of 9.7 per cent. 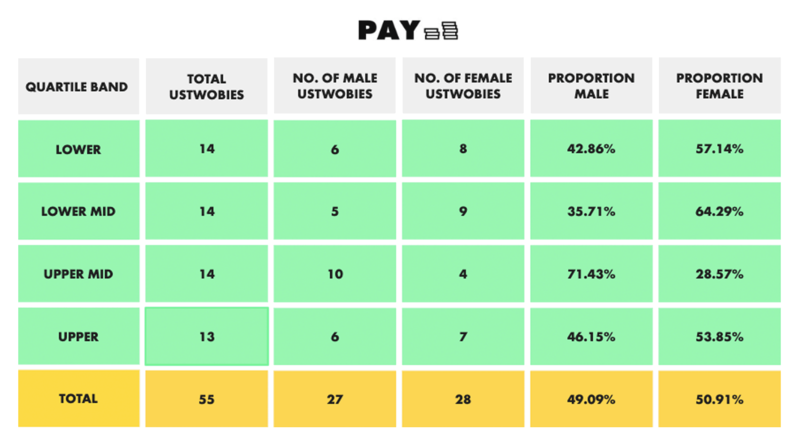 Today ustwo London shares our pay gap, which is currently -4.28%. We have reported on this for the previous two years. When I joined ustwo eight years ago, the London studio was 17% women and 83% men. ustwo was billed as the ‘studio of dreams’. The workplace culture was sealed with beers and five-a-side football – unintentionally it catered more for men than women. The hiring strategy was ‘organic’, not strategic, with a big focus on cultural fit. Fast forward to 2019 and ustwo London is a very different place. In everything, from the work we take on, to the people we hire and the benefits we offer, we try to keep diversity front of mind. We try to challenge gender roles with our flexible working policies, unconscious bias training and underrepresented leadership training programme. We hire for cultural growth and to ensure a wider range of client partnership and project opportunities. Thanks to our efforts to adjust our male to female ratio, we now have a 50/50 gender split in the London studio. ustwo London is (proudly) led by a woman and as of March four out of six on our leadership team are women. And as you can see, our gender pay gap is now reversed in favour of women, having gone from 13% to -4.28%. Our inclusivity initiatives include the ustwo London ‘Let’s Talk’ Slack channel. This was created by a male employee who has been very open about his own mental health. He encouraged employees at ustwo to share their own stories and wanted to create an open and safe space for anyone to discuss mental health. The platform is used by a diverse group as a space where people can ask for advice or give recommendations but also privately where people seek out support from others in the group. But, despite the progress we’ve made, our work is far from done. Ethnicity, age, disability and socio-economic diversity need more consideration. We also have 70% men in the upper middle quartile of our workforce. While this may be reflective of the general market, it doesn’t mean we can’t challenge it. We strive for diverse representation, but it hasn’t always been possible. Transparency on this issue is the start of the journey. Without it we can’t talk about what we need to do to improve and what we will do to improve it. When hiring freelancers, getting a diverse pipeline of candidates can be a challenge because of the time constraints on projects with a fast turnaround. Representation from BAME groups has also dropped over the past 12 months at ustwo London. We need to systematically address this. We’ve started using the intelligent recruiting platform Greenhouse for our global recruitment because its tools and training are designed to drive inclusion and to enable fairer, data-driven hiring decisions. We’re running inclusivity workshops across the studio. We’re in our second year of Flipside, the training and development programme for unemployed and underemployed young east Londoners that ustwo London was a founding partner for. We’re continuing engaging with local schools at a grass-roots level to inspire young people from less privileged backgrounds about our industry. We’re continuing to insist that all recruiters we choose to partner with commits to providing candidates from under-represented groups – something we’ve done in the past with some success. There will be more focus on earlier careers opportunities at ustwo, including for people changing careers. There will be a more proactive outreach to communities for underrepresented groups. We are taking action but the wider industry needs to follow suit and give an equal share of voice, status, power and influence to the underrepresented. There is a lot of work to do and while we believe the industry has to come together as a collective, it is also the responsibility of each individual company and agency (independent or not) to tackle this issue from within. The statement ‘I can be my authentic self at work’ is part of our twice yearly employee engagement survey. It is a metric used to discern how inclusive workplaces are and, encouragingly, at ustwo London we score highly in this area at 90%. Improving diversity is far bigger than a headcount number or a gender pay gap percentage; it’s a feeling of inclusion, belonging and engagement. We are committed to continuing to work on this as a studio and as ustwo group overall. This post was drafted in partnership with Nicki Sprinz, MD for ustwo London, and Sinead Ryan, ustwo Studios Chief People Officer.